Is she not gorgeous? Sigh. 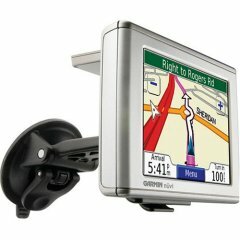 She is a Garmin Nuvi 350 GPS and I just cannot imagine my life without her! Sylvia, Sylvia, wherefore art we Sylvia? Okay, okay, all kidding aside…and maybe I’m not really kidding…this thing is great! I got Sylvia from Amazon.com just before a trip Inspector Gadget and I had to take to Lynchburg this summer on Smurf business. Neither one of us had ever been to that part of the globe and had no clue how to get to where we had to be. Inspector Gadget showed up when it was time to leave with a handful of MapQuest directions. I showed up with Sylvia. She took us right to the front door of the hotel and it was so cool. The Garmin folks say the little female voice inside that speaks American English to us is Jill but my little silver wonder is clearly a Sylvia. Don’t ask me how I know…I just do. 1. Do keep your Garmin plugged in. When the battery goes it goes without warning. I didn’t realize this and even without an initial charge, Sylvia took us almost all the way to Lynchburg with the juice she came with straight out of the box. Of course she totally left us right at a most inopportune time and we then became the comedy duo of the decade as I tried to drive the Smurf Mobile while Inspector Gadget tried to fumble through the bags in the back seat to find the car charger for Sylvia. He finally pulled a charger from my backpack, plugged one end into Sylvia and promptly discovered that the other end goes into a wall socket! Good Lord! At this point I guessed which exit to take while he fished out another charger. Ah, the joys of technology. He finally found the right charger, plugged it in and Sylvia fired right back up as if she had never missed a beat. By the way, the exit I guessed at turned out to be the right one…whew! 2. Don’t try to second-guess your Garmin…it will get an attitude. I found out quickly that if I missed a turn or jumped the gun and turned too quickly, Sylvia would say, “Recalculating”. That doesn’t seem so bad but it’s the way she says it. She gets so exasperated. You can almost hear what she really meant to say, “Harrumph, recalculating, you idiot!” I always try to remember to stroke her ego and tell Sylvia how wonderful she is and thank her every time she speaks to me. It’s a fine idea to stay on her good side. Sylvia knows her stuff so I’ve learned to trust her. She’ll get me where I need to be. I’ll be sharing more about me and my adventures with Sylvia as time goes on. She is awesome and I can’t wait to see what our future together holds. You are currently browsing the archives for the Adventures with Sylvia category.